The Texas Legislature is back in session. This is an exciting time for everyone involved in supporting The University as we prepare to advocate in favor of several priorities that will maintain UT Austin as an institution of the first class. 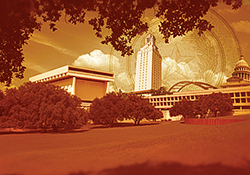 Prior to the legislature convening, Friends of The University PAC made contributions to officeholders who support UT. In the 2016 election cycle, we made 57 contributions totaling $297,500. This was a 101 percent increase over our contributions in the 2014 election cycle; all due to the generosity of our PAC members. Not only is the Legislature meeting, but Gov. Abbott has also made some key appointments to the University of Texas System Board of Regents. He appointed 3 UT Austin graduates to the board, former Senator Kevin Eltife, Janiece Longoria, and Rad Weaver. Their appointments are awaiting Texas Senate confirmation, and we look forward to their service on the board. If you would like to contribute to our efforts and support elected officials who share our commitment to The University, please visit www.friendsoftheuniversity.com and make an online donation. ‹ Save the Date: October 4, 2016!! !